Branislav Puletic - Bane, born 09.09.1952 in Bor, a little town on east side of Serbia. Branislav lives and works in Belgrade, Serbia. He attended University in Belgrade and completed a degree in geography. He was also a student in Professor Jaroslav Kandic's private art class. 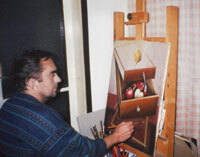 He began painting during childhood with his more serious work developing from 1985 onwards. He has had many exhibitions both at home and abroad. The greatest supports in my artistic life have been: my father, my teacher of art in elementary school Mrs. Zorica Kapelet, professor of art Mr. Jaroslav Kandic, and my family.